I’ve tried so hard to bury my past. It’s been two years since I lost so much. Two years since I started a new life, in a new college, with a new group of friends. Two years, and now my troubles are rushing back. When Derek walked into my life, he made me feel things I’d hoped never to feel again. The box I hid all my secrets in is opening, and I don’t think I am able to keep it shut this time. My past is back to haunt me, but Derek is my distraction but I’m not sure he’s enough to keep the ghosts away. I’m not sure if I’ll walk away fully intact this time. Buy Saving Grace for a heart-breaking Romance Read Today! THIS BOOK CAN BE READ AS A STANDALONE OR AS PART OF A SERIES. 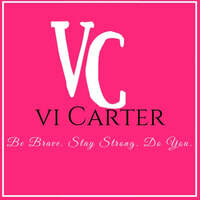 When Vi Carter isn’t writing contemporary romance books, you can find her reading her favorite authors, baking, taking photos or watching Netflix. Married with one child, Vi divides her time between motherhood and all the other hats she wears as an Author. Vi’s main goal is to give readers the same emotional ride that she got from reading Colleen Hoover and Jennifer L. Armentrout books.